Britain has a love affair with pies. They are the stalwarts of summer picnics; fat little pork and jelly parcels bundled up with hot water pastry and slice-me-up shortcrust filled with ham, beaten eggs and cheese. Then there is the autumnal arrival of those tart Bramley apples that upon baking become fluffy and sweet, caged up in precise latticework and served with Birds Eye custard, the jolly yellow colour that reminds us that we can never be bothered to make it from scratch. Then there is winter, with unctuous mincemeat dripping with suet, currants and booze that is spooned into the family sweet pastry recipe and served up from the middle of November. Yes, we love a good pie. 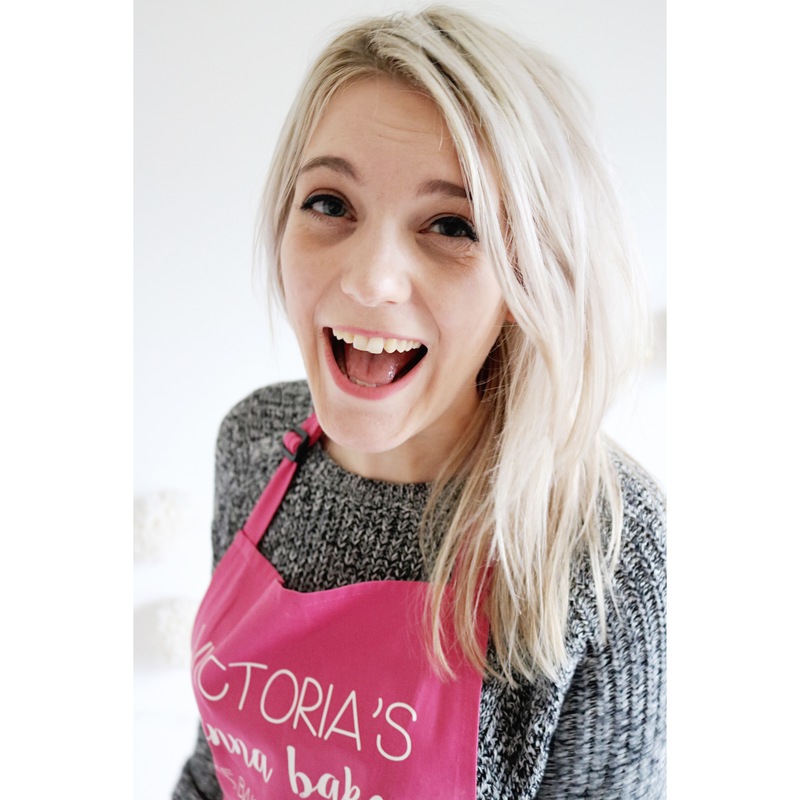 Upon thinking, it seems there isn’t much room for haphazardness with Great Britain’s love of pie; each recipe is carefully constructed and moulded to produce the same product time and time again. Ok, perhaps some families top their mince pies with stars, others a smooth disc of shortcrust, but they are all the same. Could they be a bit…boring? I think that is why I like galettes so much. They are a free form pie, a kind of ‘I fancy pie but don’t want the faff of lining a tin, blind baking and measuring lattice strips with a tape measure’ type pie. This recipe is actually a leftover one, using the cinnamon pastry from my Cranberry and Clementine Christmas Pies. Since that was taken care of, all the effort went into dressing some ripe plums in brown sugar and spices before being baked into a beautiful festive pie. Because there is barely any effort involved in this recipe it might be a nice one to serve on Christmas Eve using mince pie pastry off cuts. Bear in mind this pie would probably only serve two, so if you want to feed a crowd, use a full quantity of cinnamon pastry and double the filling, perhaps baking for around 5 to 10 minutes longer. 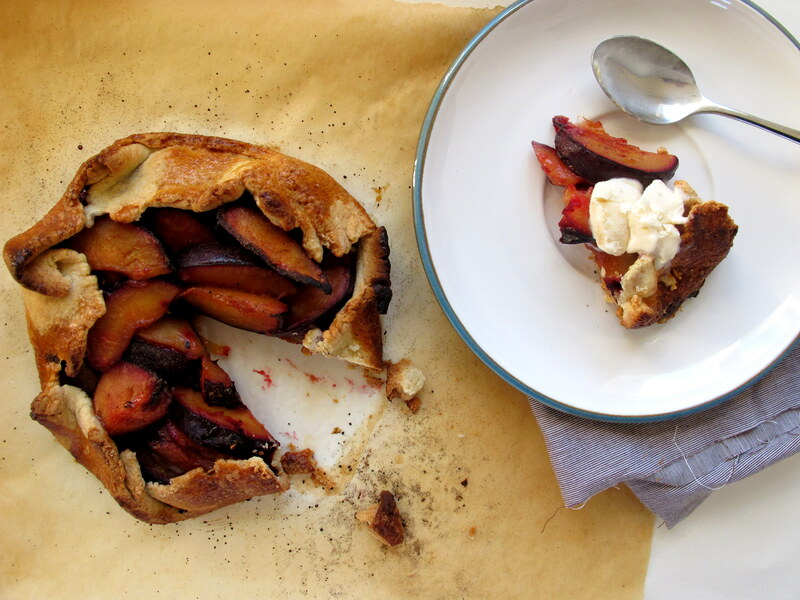 Either way it gives a stunning result and is the perfect antidote to perfect pies everywhere. Fancy a slice? Preheat an oven to 200oc/ 180oc fan and line a large baking sheet with baking parchment. 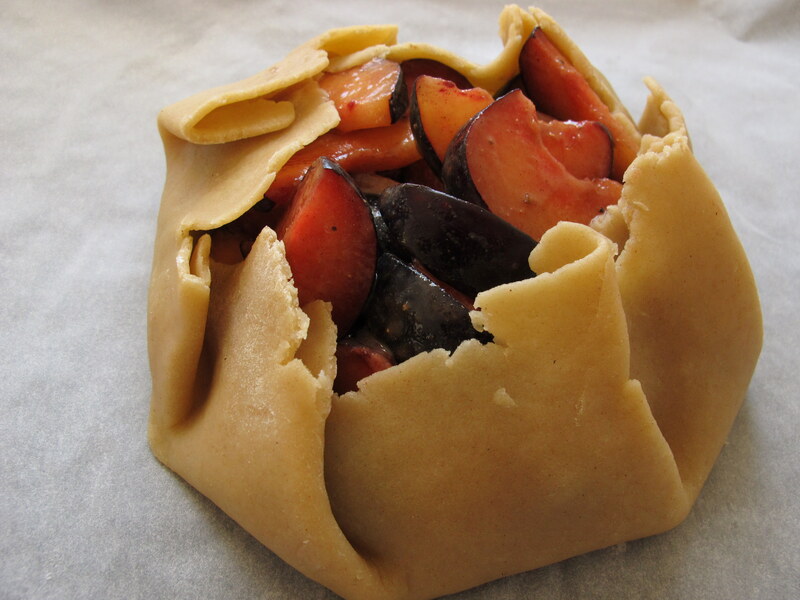 Remove the pastry from the fridge and leave to come to room temperature slightly. 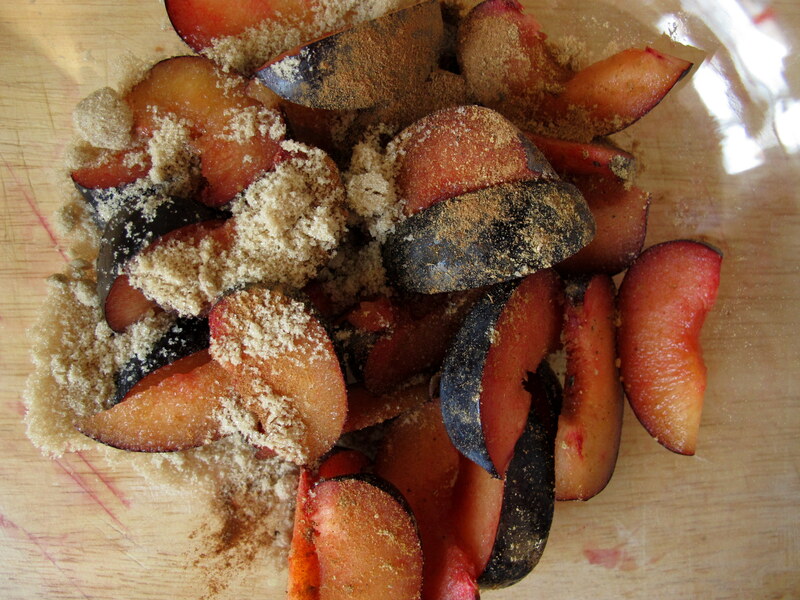 Slice the plums into eighths and place in a medium sized bowl. Sprinkle over the spices and sugar and stir to combine. Sprinkle over the flour then combine again. Set aside. Flour a clean work surface then carefully roll the pastry to a rough circle that is around the size of a 20cm sandwich tin. 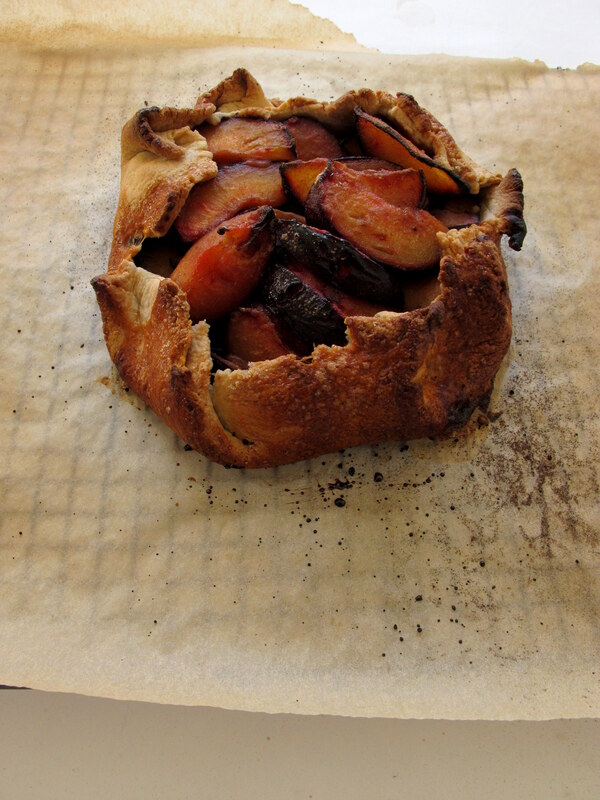 Don’t worry if the edges are jagged, a rustic looking galette is quite nice. Roll to around 5mm thickness then carefully transfer to the baking sheet. Don’t worry if a piece breaks off, just press it back on and roll with a rolling pin to bring back together. 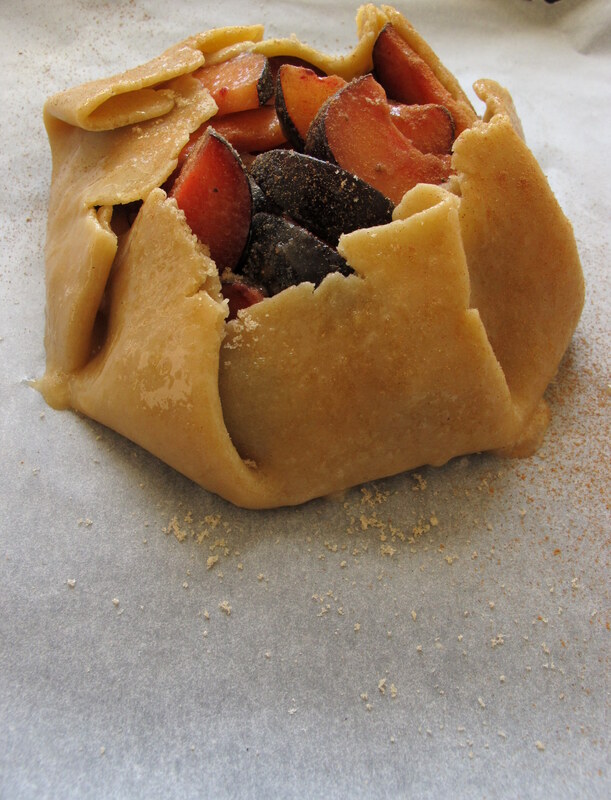 Pile the spiced fruit in the middle of the pastry then fold up the sides. The best way to do this is to fold up one piece then move clockwise overlapping slightly and pinching a little. Brush the pastry with the beaten egg and sprinkle over a little cinnamon and brown sugar to finish. Bake in the oven for around 20-25 minutes until the pastry is golden and the fruit jammy. Remove from the oven and leave to cool slightly before serving warm. A dollop of vanilla ice cream adds the perfect cooling texture.